The balls are set with the yellow Ten Ball on the Centre Spot. Red balls in a diamond configuration (see below) and the coloured balls on their respective spots: Black on the black snooker spot, Pink also on its snooker spot, Blue on the snooker green spot, Brown on its snooker spot, and green on the yellow snooker spot. The red balls are placed around the Ten Ball, touching each other. The break shot player must alternate for each frame. The cue ball is played from any point on or behind the baulk line by the breaking player. The cue-ball must hit the APEX red ball of the diamond configuration, breaking open the balls, so that at least four red balls hit the cushions or pockets of the table. 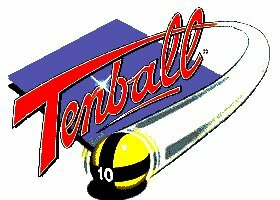 If the cue-ball or a coloured ball enters a pocket during the break shot it is a foul, ALL of the potted balls are re-spotted. If during this break shot (or at any stage during the frame) more than one red is potted in a single stroke, the player scores one point per potted red ball, continues his play, and must attempt to pot the same amount of colours as potted reds, but only in succession. The value of the first coloured ball legally potted during each individual break denotes the value of all of the coloured balls throughout that break, i.e. if the first coloured ball potted during the break is the blue ball, all of the coloured balls potted during that break are worth 5 points. The coloured balls revert to their original value when the player fails to pot a ball. When the final red ball is potted and the next coloured ball played, the coloured balls are then potted in ascending order of their original set value, starting with the green ball, finishing with the Ten Ball. A ball must touch a cushion or be potted during every stroke played. A Red ball potted during an illegal stroke, or off the table, is spotted on the Centre Spot. If whilst re-spotting any ball, the deemed spot is occupied, the ball is placed on the highest available spot, or if no spots are available the ball is placed at the nearest point to it's designated spot, in direct line with the top cushion. If the cue-ball has been potted or is off the table, it is re-spotted on the brown ball spot, or if occupied, at any point on the baulk line between the Blue Ball Spot and the Green Ball Spot. If at the end of a frame the scores are equal, a 'shoot out' decides the game. A ball cannot be removed from the table and cleaned unless there is a foreign object on it. Chalk dust is not deemed to be a foreign object. If a foul is committed all balls shall remain where positioned, except if potted, or off the table, whereby they shall be spotted on their original spot. A jump shot is not a foul stroke. All points scored before the foul stroke are allowed. When a foul stroke has been played, the NEXT player has the option of taking the cue-ball in-hand OR adding 10 points to their score, either playing the cue-ball from its resting position or requesting the previous player to play again from the resting position. The resting position is also the re-spotted position - if potted or off the table. If the on-player decides to play in-hand, the cue-ball may be positioned anywhere on the table and played in any direction. ALL fouls incur this choice of penalty apart from, if on the BREAK SHOT, four balls do not touch a cushion or the cue-ball does not strike the Apex red ball first, the next player has the option of either playing in-hand or requesting the previous player to break again. A player will lose the frame if he commits three successive fouls. Disclaimer : at any time, any part of this homepage and its associated documents may be under yet another unannounced reconstruction.